Every home has a story. The Earnhardt Collection™ Sugar Maple celebrates one man’s love for his beautiful wife. Kerry and René Earnhardt believe that life is influenced by the beauty of nature, family and the moments share with friends and family at home. Their philosophy inspired the Earnhardt Collection™ by Schumacher Homes, and each home within the collection is inspired by the family’s personal stories. Kerry named the Sugar Maple for René, his wife of 18 years. The Sugar Maple is one of the most distinctive homes in The Earnhardt Collection™. In addition to the wide open spaces and huge number of windows, the Sugar Maple also features a stunning wraparound porch accented by heavy wooden pillars built on rock pedestals, and four spacious bedrooms, including an owners’ retreat with a huge walk-in closet and bath. At Schumacher Homes, we always say, “Your Inspiration has a Home.” For Kerry and René, we can say their love has a home. Find the home where your life and love will unfold. Traditions bind us and give us stability. They give us the ability to enjoy time together, and give us something to look forward to. Traditions often provide us our favorite memories. 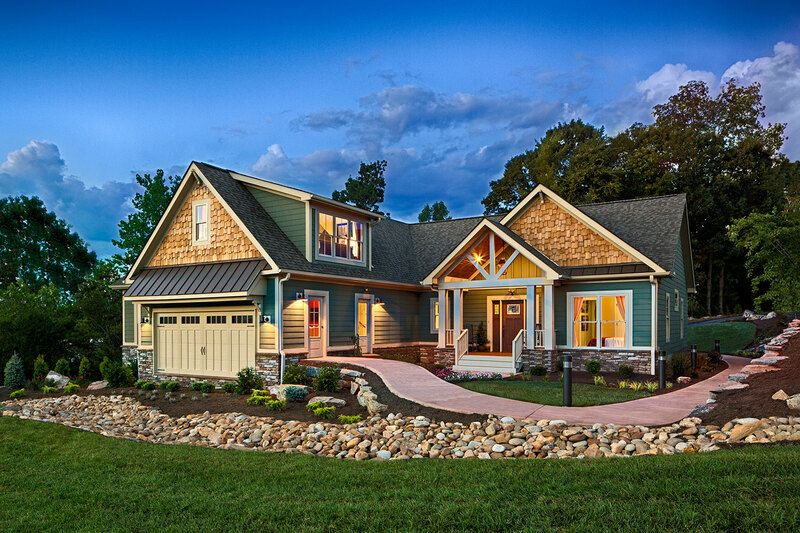 Designed on a foundation of tradition, it’s no surprise that The Earnhardt Collection™ Pikes Peak by Schumacher Homes has become one of our homeowner favorites. Kerry Earnhardt explains that it’s tradition for he and René to climb Pikes Peak summit every race season in Colorado Springs. 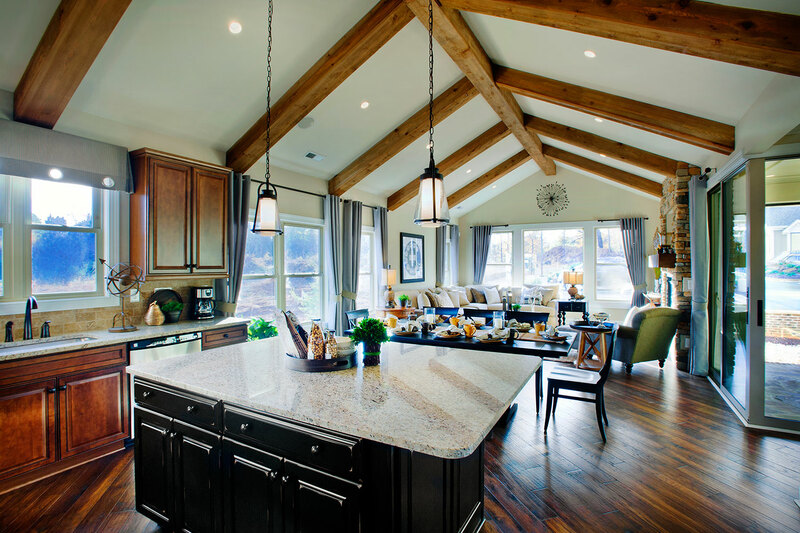 Customers can get a feel for the Pikes Peak floor plan by visiting one of Schumacher Homes many Design Studios. The Pikes Peak is a stunning one-story home that truly provides a spectacular view of the great outdoors. From the moment you catch site of this home with its beautiful covered porch to that first step into the foyer displaying an abundance of natural light, you’ll picture your family’s escape from the world. The great room has an open feel accentuated by a cathedral ceiling that leads directly to the back porch where you can relax and unwind. When it’s time to entertain, you’ll be happy to gather around the large kitchen island. And in the evening, the large owners’ retreat, with plenty of walk-in closet space and a spa-inspired owners’ bath, provides a great place to retire after a long day. And with three bedrooms, two baths, and more than 2,000 square feet, there’s plenty of room for the whole family! We all know how to buy the small stuff, but when it comes to shopping for a new home, where do you begin? Finding your inspiration isn’t hard, but it does take some thinking. Start with you and your family. Are you a large family seeking more space, or a couple just starting out? Do you have an extended family where mom and dad may need to move in eventually? What are your interests? Are you a nature lover or an artist that requires a home with open space and lots of windows for optimal light? Are you an amateur grease monkey who likes a huge garage space? A sports fanatic who needs a great game room? Are you a culinary wizard whose frequent entertaining demands a large kitchen? What do you need? Do you work from home and need a substantial home office? Are you a pet-lover and need a first-class room for your dogs? Do you need lots of closet space? Do you have a large family or entertain often and need a spacious great room where everyone can be together? Start by taking inventory of your interests and needs. Deciding where you’re going to move your family cannot be taken lightly. You’re choosing the place where your life story will unfold. You have to make sure that it is just right for you. Put simply, there’s no substitute for living in a home filled with choices made by you, for you. When you build a custom home, you’re not limited to just decorating rooms. Your home will have your vision and be a place for you to express yourself in ways you never expected. Now that you’ve got your thoughts together, get out and experience a variety of model homes. Take them for a test drive. Feel for quality; feel for design. You’ll get a gut instinct on what’s right for you. Walk through several different floor plans to see what designs feel best for your family. If you like the floor plan but not the facade, check out the different facades (elevations) on the website, or look for another home with a similar floor plan. Think about what could be changed or added to make the home perfect for you. Scrapbook and catalog your experience. Make lists of what you liked and what you didn’t. Getting your inspiration correct is essential in your new home search. Your inspiration should define you, your interests, your wants and your needs. Once you’ve figured your inspiration out, customizing a perfect setting is easy.